A lot of features, friendly and fast support. I personally had problem to actually install it, but now it is ok.
Really powerful uninstaller that will do his job. Some days ago I had some problems on my computer in office, well basically I installed one seo software (I can’t name it, because the last thing I need is some problem with author), everything were great, but then my computer crashed so often because of this software and I needed to uninstall it. Well problem was that I cöuldn’t at all, so I had to look for some software that will do that job (well I was thinking to reinstall my computer also). I tried a lot of softwares (free and premium – I also tried perfect uninstaller, which you can learn more in this perfect uninstaller review about that software) and I had success with Mighty Uninstaller (well I also tried Perfect Uninstaller, but this software is just better in my opinion, so I decided to create this Mighty Uninstaller review. In this Mighty Uninstaller review I will try to show you how this software works, how the interface looks and also I prepared Mighty Uninstaller video review for you, so you can see how this software works in real time and then you can make your own decision about this software. So there is my honest Mighty Uninstaller review. First the price of this software is really reasonable if you compare to another softwares with similiar functions, because you will recieve so many functions and features just for 39 dollars (I will talk about these features later in this mighty uninstaller review). So first fact about this software – awesome price. Then you should know that it will remove any software that you can’t install with windows uninstaller and if it will fail, you can contact their support team and they will do it for you within a few hours, how great is that ? Well I know that you want to see how this software looks, so there is my screenshot taken from the dashboard of Mighty Uninstaller. If you want to really see how this software works, I recommend you to check my Mighty Uninstaller review on Youtube below. Also another fact that you should consider before buying is that you can download and test it for free to actually see if this software is right for you or not. And honestly I really recommend you to test it before buying to prevent any further problems, but don’t worry if you will not like that software after purchase, then there is 60 days money back guarantee. So you will recieve your investment back without any questions. 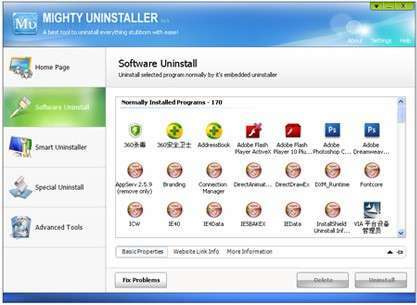 As I said earlier in this review, Mighty Uninstaller has a lot of functions. Well it will help you to uninstall any file, but it will also check if there is any corrupted installation and if so it will help you to fix it or even remove (as you want). It can also help you to uninstall all spam toolbars, hard antivirus and so on. Honestly this software (or any similiar) should be installed in every computer. Also on their website is a lot of tutorial that will help you to remove popular softwares like McAfee and so on. These tutorials are free for you, so you can check them there. If you are facing some problems with unwanted softwares installed on your computer, then Mighty Uninstaller may be answer for you. Also remember that there so many features like awesome price, great support and also money back guarantee, so you can’t lose at this moment. I also hope that this Mighty Uninstaller review helped you to make the right decision and also that you found at least this Mighty Uninstaller review useful and helpful. And if you have any questions related to this review or about me, feel free to contact me anytime you want.